Another day-trip I took this summer comin in hot! 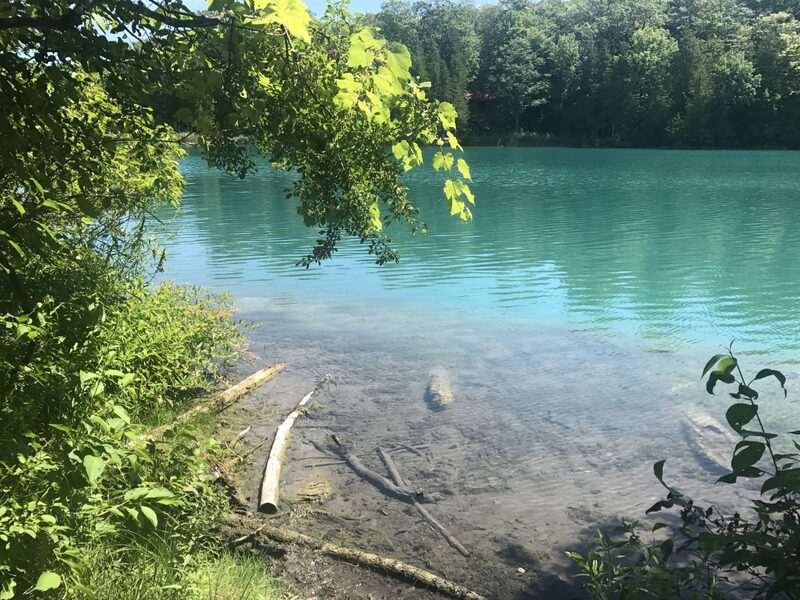 Green Lakes State Park is located east of Syracuse, NY in the Town of Manlius which is just a short 2.5 hr drive from Buffalo. It takes approximately 1 second after arrival at the park to see where the name came from. There are two stunning glacial lakes located here surrounded by forest scenery. The park has trails that total to about 10 miles worth of hiking/walking. These are more “nature walks” than hikes set around beautiful views. 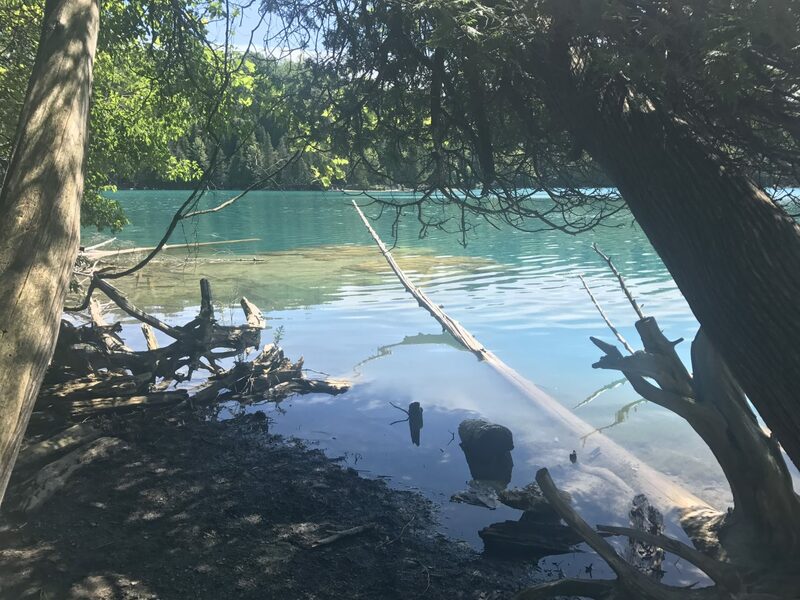 I wanted to walk along the water so I took both the Green Lake and Round Lake Trails which you can connect into a figure 8. This allows you to go around both lakes while never passing the same exact spot twice. Find details on how exactly to take this path here. It was pretty crowded this day as there is a small beach with swimming/picnic areas and it was a beautiful day so plenty of traffic on the trails; but they are wide enough where you never feel too crowded when passing others. Also noteworthy: LOTS of kayaks. I was walking alongside a group of kayaking friends who included one guy who had discovered a large hole in his kayak and it was sinking fast. He did not let this ruin his fun though. He ditched the kayak and tied himself to another friend’s kayak and enjoyed a lazy afternoon float in the lake. I give this guy a 10/10 on the fun-scale. Here’s where you learn something else about me. I’m a bit a nature science nerd. So here’s some stuff that I found cool about this place, that you may or may not also find cool. 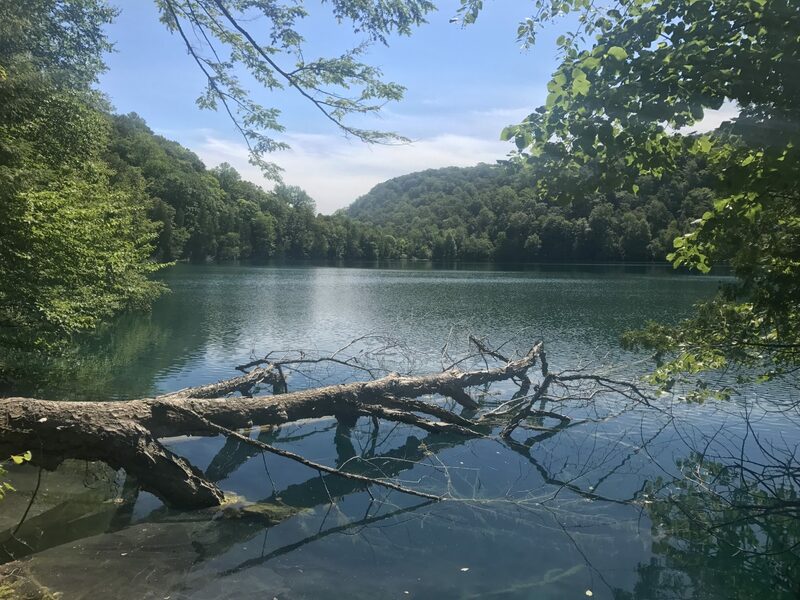 If science is not in your wheel-house, feel free to skip this paragraph 🙂 The two lakes located here, Round and Green Lakes, are both meromictic lakes, which means that there is no fall and spring mixing of surface and bottom waters. Why is this cool? Because this means there is a high potential for ancient plant and animal life evidence to flourish. These lakes look like mini-golf course ponds. Ya know, the ones where they dye them to create a blue-green color that looks obviously fake? Except the coloring here is au naturel. 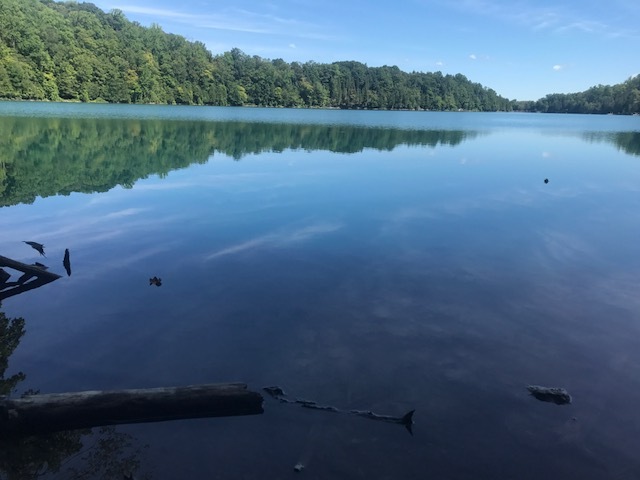 The reason for this is that almost half the water that enters these lakes comes through the bedrock. This makes for water with a TON of dissolved minerals that you cannot find in the water that enters the lakes from rain or snow. 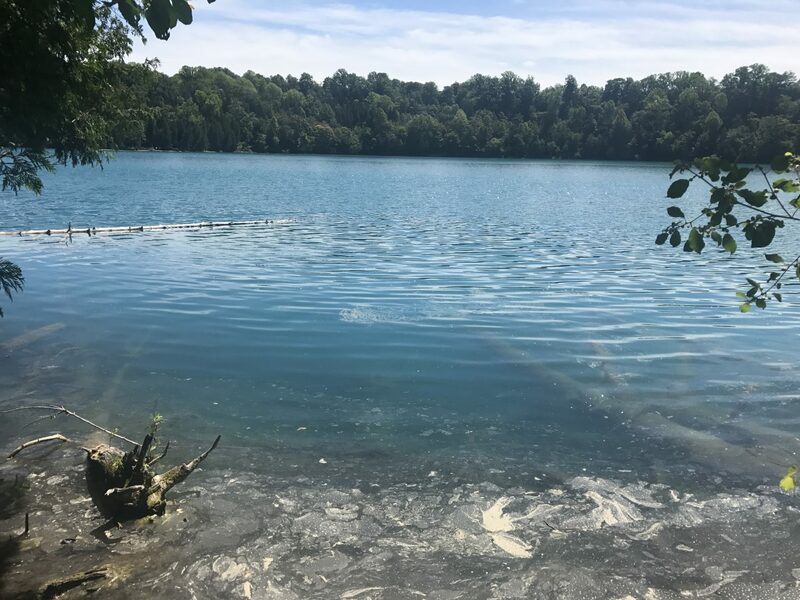 These waters contain heavy loads of sulfur, calcium and magnesium which leads to “whiting” events – small crystallites of calcite and other minerals precipitate each year. Pretty, pretty cool if ya ask me. Even if you don’t find that stuff as interesting as I, you’ll still love the colors of the lakes. I promise. 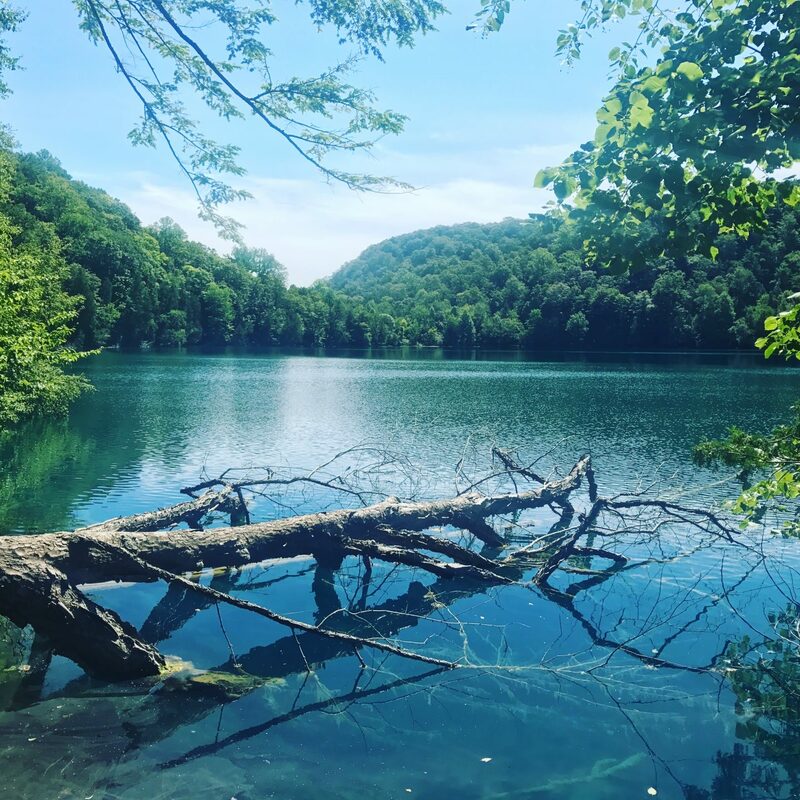 This place is definitely worth the trip for a couple hours of an easy walk and it may take you even longer due to there being so many photo-worthy moments of the amazing aqua-colored lakes. This a great place for families with kids to walk around and enjoy some nature. 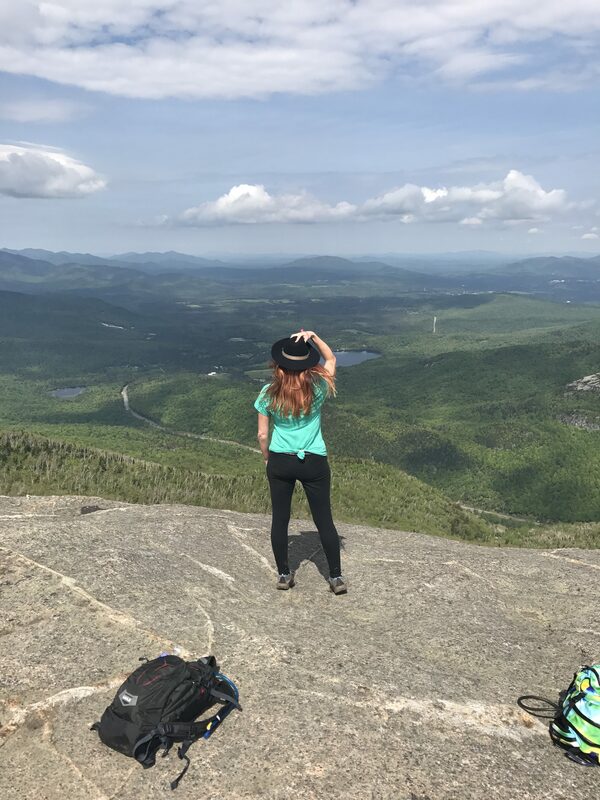 It was really difficult for me to narrow down which pictures to include on this post so I went a little crazy on it in an effort to really capture how beautiful it was! Enjoy! Oh no…..the color of the golf ponds is fake…..well they still eat plenty of my golf balls. Another beautiful posting. Gorgeous! Never even heard of them but now I need to go. Also, super cool science nerd stuff!